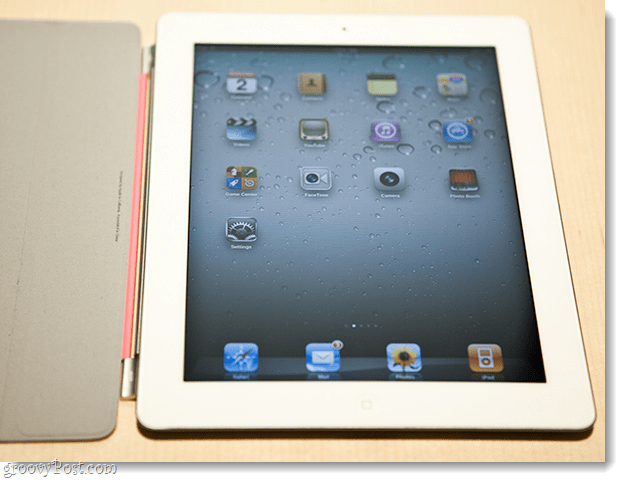 Today in San Francisco Apple CEO, Steve Jobs, unveiled the official iPad 2; that is officially the name of the device. The iPad 2 will go on sale in the U.S. March 11, in stores at 5:00pm local time, and online at midnight. The pricing structure is similar to the old iPad, but this time around there is the option for a 3G service with at&t or Verizon. Apple has made a number of improvements to the device since the original iPad, so we’ve drawn up a iPad 2 vs. iPad 1 comparison. Let’s talk about what the iPad 2 has over it’s predecessor. The first thing I noticed is that the device is smaller, yet the screen size is the same. Apple has done this by giving the iPad 2 a smaller bezel in exchange for a 16% decrease in weight. The device is also about 33% thinner than the original. For those people out there who are white iPhone fans, the iPad 2 is also available in white, or black –2 colors this time! Next is the CPU, the iPad 2 has an A5 Dual-core processor. This is a huge improvement in computing power over the previous A4! They’ve also improved the graphics processing unit, and between the two upgrades graphics should process up to 9x faster. The best part is that the new chips are so power efficient that it despite the extra ability, the battery will still last 10 hours. 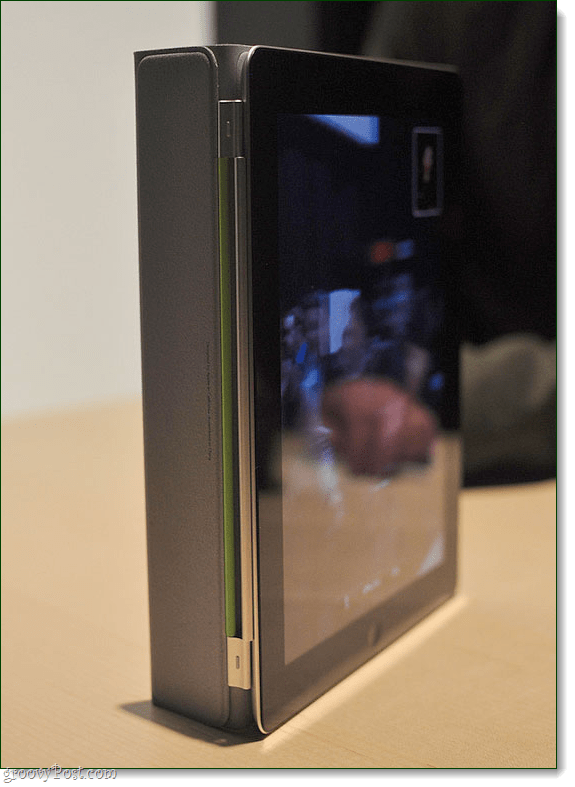 The rear side of the iPad 2 has a built-in camera capable of recording 720p video at 30 frames per second. While it isn’t the greatest camera, it is a huge step up from no camera at all. The front side has a VGA quality camera that takes pretty horrible photos, but is designed specifically for use with Facetime and other web video chat programs; the rear camera makes up for it. One of the best new features though, is the HDMI out via an adapter that sells for $39. Apple brought in video mirroring, so whatever is displayed on your iPad screen will also be displayed on the TV or monitor you plug the iPad into. The iPad 2 is capable playing back HD 1080p video. The iPad 2 has one of the grooviest covers I’ve ever seen. 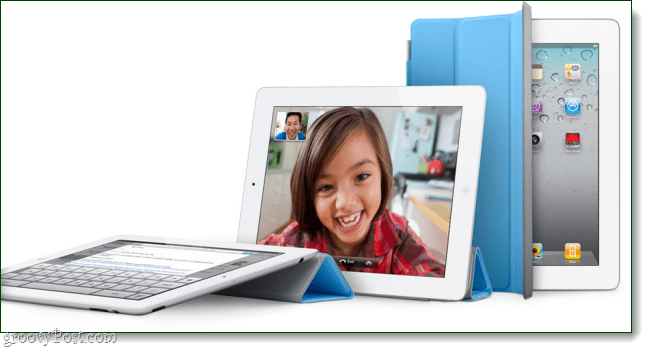 It is a thin and durable and made out of 4 partitioned columns of magnetic strips that align perfectly to the face of the iPad 2. When you close the cover it will automatically Sleep the iPad 2, and when you open the cover it automatically wakes it. The cover is available in 10 colors; 5 in polyurethane ($39), and 5 that are leather ($69). Unfortunately, the cover is not automatically included when you purchase an iPad. Incase you’re wondering –the smart cover does not work with the iPad 1. 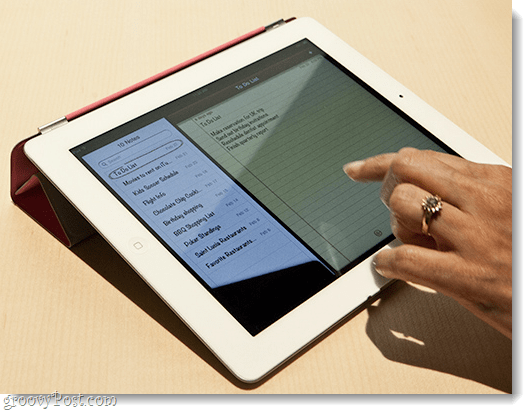 How does the iPad 2 compare to the iPad 1? 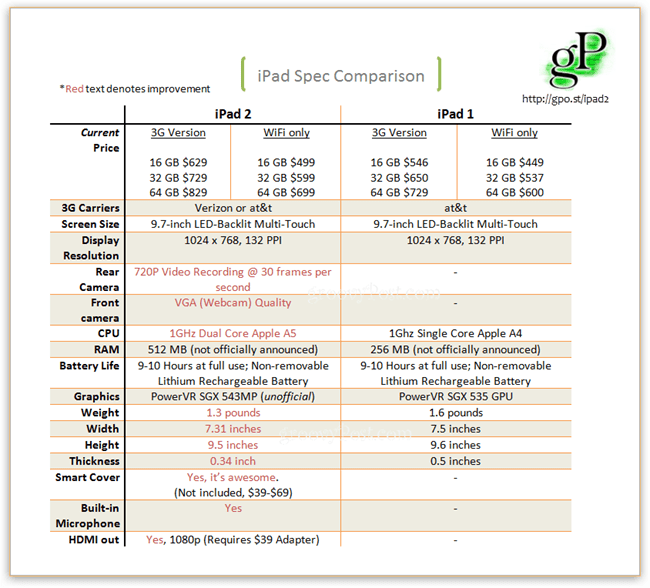 The iPad 1 vs. iPad 2 comparison chart. The iPad 2 will go on sale internationally March 25, 2011. Apple Store Link for the Smart Covers. Apple Store Link for the iPad 2. @nick – Thanks for pointing that out, fixed! Fun fact: the difference in weight between the iPad uno and the iPad 2 is about the weight of 24 quarters. So, when you get your iPad 2, and you want to see what the rest of the world feels like, try taping 6 dollars worth of quarters to it and lug it around for awhile. Right…. so the ipad 2 has got camara’s. Wow. Yeah. Not realy wow. There are Android tablets that are better, faster then the ipad2 atm. So Apple is running behind. Nothing new with this thing. Still to big. And 10 hours of battery? Such a larg device and only a battery that works for just 10 hours? Wtf? I thought Apple was a compagny that innovated? Why not invent a battery that lasts for at least a day? Well call me old fashioned but, I love my iPad. I use it a lot and i have no plans to move to an android. but like mrgroove said, I also have no plans to upgrade until i can get a 4g card in it. I do think the covers are pretty cool. Magnets…. now that is innovation – first ppl to come up with that. You realize thus significantly when it comes to this topic, made me for my part believe it from a lot of various angles. Its like men and women aren’t involved except it is one thing to accomplish with Woman gaga! Your personal stuffs excellent. At all times handle it up!